Adding hyaluronic acid serum to your present skincare regimen is essential if you want to keep your skin’s youthful glow. Unfortunately, with the long list of serums available today, it’s easy to get confused and misled. Instead of bouncing from site to site trying to find the right product, we’ve gone through the hard work of researching the best hyaluronic acid serum. We’ve narrowed down the list to the 5 best products so you can easily pick the best one for your skin. The Original Hyaluronic Acid Serum by Timeless Skin dries quickly on the skin. It has a non-greasy formula that contains no parabens and other irritating ingredients. The serum is a bit runny which can be a major deal breaker, especially if you are looking for a serum that’s thicker and shows results fast. 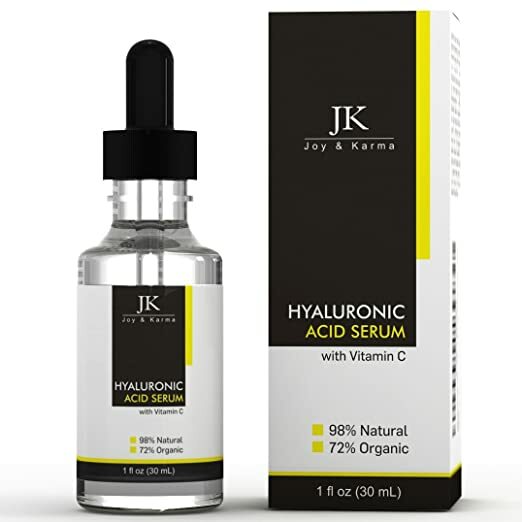 Joy & Karma’s Best Hyaluronic Acid contains 98% natural ingredients. We're fond of the product because it has MSM, Vitamins C and E on top of its hyaluronic acid. However, unlike Radha Beauty's serum, this product comes in a clear glass bottle.The company tells that the product is soon to have a new packaging. Cosmedica Skincare Hyaluronic Acid Serum, unlike the two previous serums, contains pure hyaluronic acid. It's sold in four different sizes. This serum has a thin consistency but goes well when applied to the skin. It doesn't leave any sticky feeling as well. InstaNatural ﻿Hyaluronic Acid Serum comes in a large quantity at 60 mL. Its packaging includes a blue glass bottle with a dropper. Packed with similar vitamins, we liked that this serum contains vegan hyaluronic acid. We also liked that it can be used under makeup. O﻿Z Naturals Hyaluronic Acid Serum, on the other hand, has 5% hyaluronic acid. Aside from its potency, users particularly liked that it's cruelty-free. Although it can deliver results, a few people who have used the product consider it sticky and drying. 1. It aids in the hydration of your deep tissues. 2. It triggers collagen production. The Original Hyaluronic Acid Serum has a non-greasy formula. It’s a perfect match for people who don’t have too much free time to sit down and wait for their serum to dry in the morning. One good thing about this product is that it doesn’t have parabens that can potentially trigger several skin issues. It penetrates the skin easily so that you can get brighter and moisturized skin after use. The texture of this serum is a bit watery. If you are looking for a thicker serum, you might as well skip this one. Joy & Karma’s Best Hyaluronic Acid has 98% natural and 72% organic ingredients. It’s been manufactured and packaged by an FDA approved facility so you’re assured that it’s safe and effective to use. This serum also contains Vitamin C and E. What makes it stand out more is that it also contains Methylsulfonylmethane or MSM. MSM works to make your skin more flexible and supple when applied topically. Aside from these effects, it also has skin-repairing properties. J&K serum comes in a clear glass bottle with a dropper. It makes the skin feel tighter and smoother upon application. Unlike most serums, this product doesn’t leave any residue on the skin. Some people who tried the product noticed a lightening effect on their scars. While a lot of users did see good results after using the product for a few weeks, there are others who experienced breakouts and irritation. 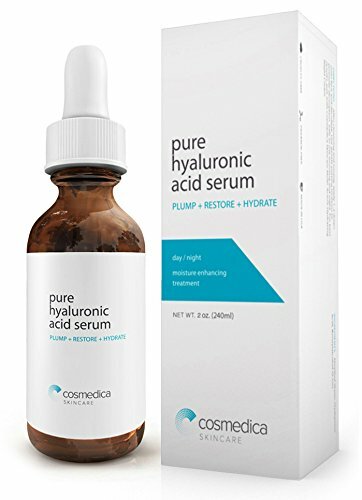 Cosmedica Skincare Hyaluronic Acid Serum contains pure hyaluronic acid. It specifically targets fine lines, wrinkles and dark spots. It comes in four different sizes with its smallest at 1 oz. The product gets absorbed well into the skin without any residue. Users liked that it helped tighten the skin without any drying effects. Some of them even used the product twice a day with no adverse reactions. As for consistency, a few people find it too watery. They think that its consistency is too thin for a serum. Packed in a blue glass bottle, InstaNatural Hyaluronic Acid Serum has Vitamin C, E and green tea extracts. Aside from these ingredients, it’s hyaluronic acid is vegan so you’re assured of its purity and effectiveness. The product offers 60mL hyaluronic acid. Because it has a large amount, you’ll have enough serum to diminish your wrinkles and age spots. The product has a gel-like to runny consistency. This texture helps the serum penetrate better into your skin. Users were fond of using the serum under makeup. Aside from that it doesn’t grease up, the product also helps makeup application go on smoother. While there are a lot of people who saw quick results, there were a few of them who experienced delayed effects. OZ Naturals Hyaluronic Acid Serum has 5% hyaluronic acid to deeply hydrate and plump up your skin. Aside from vitamins C and E, this serum also has wildcrafted green tea for added antioxidant benefits. Users noticed that the serum is concentrated in nature. Because of this, they consider a few drops enough to cover their entire face and neck. The product is soothing and delivers results fast. It helps make pores smaller and fine lines less visible. A lot of users liked that the serum is cruelty-free. They also consider it as a good alternative to extremely high-end face serums. Some of the people who tried the product had problems with its consistency. It’s sticky and felt drying to the skin. There are two main mechanisms on how hyaluronic acid can help improve your skin. Hyaluronic acid has the ability to attract and hold in moisture several times more than its weight. While there are ideas that suggest that large molecule HA can have a hard time getting absorbed by the skin, there are also clinical studies that prove the ability of HA to penetrate both epidermis and dermis. Because of these properties, HA, when applied to the skin, can almost instantly plump and hydrate your skin. And because it can reach the deeper layers, you’re likely to get effects that can last longer than your average creams and serums. Collagen is a naturally occurring form of protein, specifically polypeptide, inside our bodies. However, as we age, its production and supply tend to diminish. One of the most common effects of this process is the loss of your skin’s elasticity. Sagging skin and wrinkles become more prominent as you age. Hyaluronic acid is essential for the production of collagen in your body. By triggering your skin to produce more collagen, you’re helping your body dramatically slow down the signs of skin aging. Hyaluronic acid should be applied after washing and toning your face. It works best on damp skin. After application, you need to use a good moisturizer to seal the product into your skin. Make sure to apply the serum all over your face and neck. Take extra caution when using near your eye area. If you have oily skin, it’s best if you can mix the serum with a lightweight moisturizer first before application. In applying the product, we recommend using a patting motion to allow the product to sink into your skin. As much as possible, do not smear or rub the serum as it can cause minute damages to your skin, particularly when it’s wet or damp. When looking for a hyaluronic acid serum, it’s best if you can get a product from a vegan source. This can help you know how pure or potent the serum is. You should also steer away from serums that contain alcohol. One of the best ways to find out is to read product labels. Because alcohol can be drying and irritating, not all companies would directly advertise that their serum has it. Instead of fully relying on advertisements, it’s wise if you can examine the product first. The presence of water also dilutes the potency of HA serums. When looking for the right product, try to get one that has pure hyaluronic acid content. Aside from water, you should also examine for any chemical fillers, preservatives or chemicals used. Hyaluronic acid serum is slowly becoming a staple in people’s skin care routine. If this is the first time you’re considering this serum, it’s essential that you start off with the right product for your skin. ​Because we know how overwhelming it is to choose, we’re rounding up OZ Naturals Hyaluronic Acid Serum as our top pick. Its combination of Vitamin C, hyaluronic acid and Rose Hips makes this serum a perfect solution to most of your skin issues. ​Aside from its anti-aging and antioxidant properties, these ingredients can also address scars, acne and age spots. They are also effective in hydrating dry skin and in improving your overall skin tone. ​If you have dry skin or if you’re starting to notice the inevitable signs of skin aging, we suggest you consider this serum. However, similar to the application of new products, it’s recommended that you do patch sensitivity tests first before using the serum on your entire face.